Posted: October 19, 2017 in Features, Who,What,Where & When...? 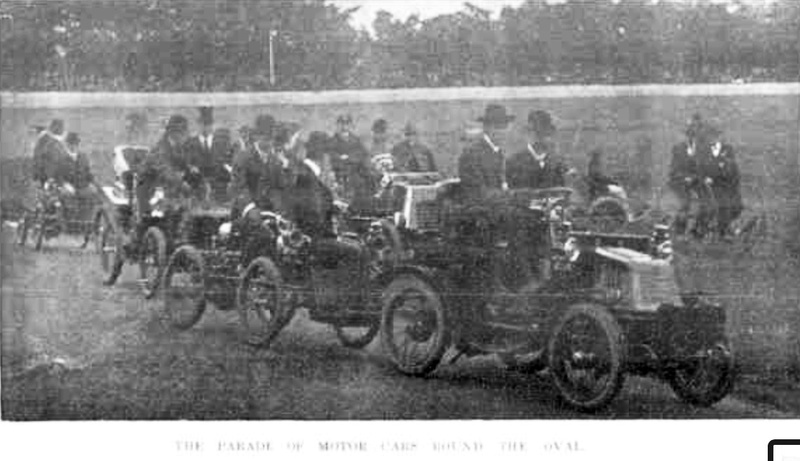 Whilst not a car race but a ‘demonstration or parade’, what seems to be the first event of this type in Australia was held at Adelaide Oval on Saturday 11 October 1902. More interesting is that the first claimed motor-cycle race in Australia took place on the same day. The Adelaide meeting was promoted by the ‘League of Wheelmen’ a cycling organisation at no less a temple of sport than the wonderful, picturesque Adelaide Oval, not at all a venue I would have considered as one at which ‘motor racing’ took place. Located in North Adelaide, Adelaide Oval is the best sporting venue in Australia. That my friends is a huge statement for a Melburnian member of the Melbourne Cricket Club, our ground is the Melbourne Cricket Ground. We Melburnians reckon the MCG is the best bit of sporting dirt on the planet, but good ole Adelaide Oval is better. It doesn’t win in terms of seating capacity, but the location, surroundings, vibe, the hill and scoreboard, the vista of trees towards St Peters Cathedral cannot be matched. And having seen a few stadiums around the world its ‘up there’ with the best globally in character and comfort if not capacity. 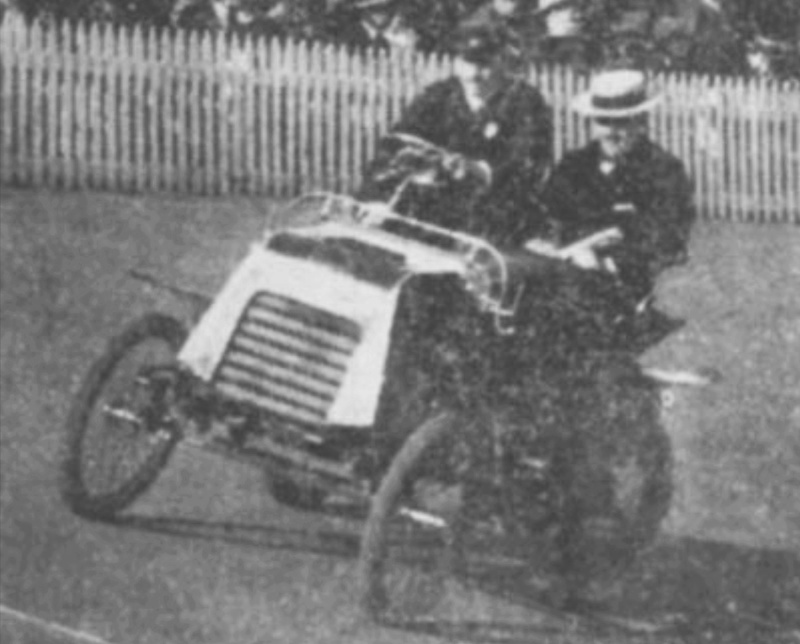 That Saturday the League of Wheelmen hosted a day of racing- cycling, motor car demonstrations and the new ‘sport of kings and millionaires’ as the Adelaide Advertiser put it- motor racing. The motor-cycle racing 5 mile event event was ‘the first motor race in Australia’ the paper reported. The hallowed turf primarily used for cricket and football (Australian Rules) then incorporated a steeply banked track at its outer perimeter which was ideal for cycle racing and ‘admirably adapted for contests between motor cycles and for the establishment of records’ if not so great for motor car racing. The days program was dominated by cycling events with many interstate competitors taking part. In addition there were 13 contestants of the motor-cycle races in the afternoon with ‘the final’- my god, a championship! to be held the following week, on 18 October. An interesting part of the program ‘to indicate the growth of the (motor) industry’ was a parade of cars, motor-cycles, quadri-cycles, cycles and velocipedes, the organisers showing a keen sense of history of transport with a focus on the previous thirty or forty years. The Adelaide Observer reported that the display created a favourable impression. ‘The big cars whirred around the track with surprising velocity, and so easy were they to control and so graceful in their evolutions that their popularity is assured’. It seems fair to say that the success of the demonstration of cars on that October day, and the following weekend provided some type of impetus for the first car race in Australia at Sandown and the first car race in South Australia, at Morphettville two years later. We forget sometimes just how far we have come. The Adelaide Observer of 18 October 1902, in an article entitled ‘How The World Moves’ comments upon how the dreams of Jules Verne were coming true. At the time the voyage to America from the UK had been cut to 124 hours, ‘with only 70 hours at sea’. ‘In rather less than 400 years the record of Magellan in circumnavigation of the globe has been cut from three years to between 50 and sixty days’. ‘The opening day of the League of Wheelman’s October race meeting marked an interesting epoch in the history of cycling. One of the events on the programme was a motor cycle race- the first held in the Southern Hemisphere, and it was to be the introduction of this novelty and an exhibition of motor cars that the large attendance was due’. ‘From the early nineties the safety revolutionised cycle racing, and record succeeded record at a bewildering rate, until it became common for a cyclist behind pace to eclipse the times of the best racehorses the world has ever produced’. ‘The popularity of the sport developed…the League of Wheelmen…at one time promised to become a very wealthy body…but two or three years later the absence of crack riders from the other side of the world and the lack of variety in the sport, coupled with unfavourable weather conditions, resulted in unprofitable meetings’. ‘The other novelty of the meeting was the motor cycle race of 5 miles’. Originally their were 13 entries with the race divided into two heats, with two machines withdrawing from the first heat. ‘TP O’Grady was off scratch, W Courtney 30 seconds, A Allison 50 and W Baulderstone 1 min 5 sec. Baulderstone was away well and had almost completed a lap when O’ Grady was pushed off. Courtney retired early with a mechanical problem. O’ Grady’s machine took a while to get going, but when it did it was soon seen to be the fastest machine on the track. It lapped the others three times in the 15 laps and covered some of the circuits in 32 and 33 seconds. Its fastest pace was at the rate of 1 min 32 sec for the mile, or 30 miles per hour. O’ Grady an old time racing man, who constructed the motor himself at Mr V Lewis cycle works, was loudly cheered as he finished his five miles journey in 9 min 10 secs. Just after he crossed the line the belt of his motor broke. There was an interesting run for second place between Allison and Baulderstone. The latters machine lost the pace with which it started, and Allison was able to keep ahead’. A story about Vivian Lewis and his nascent cycle, motor-cycle and car company is a story in itself, O’Grady was Works Manager, Works Rider/Driver! and a shareholder in Vivian Lewis Ltd. The Adelaide Observer had this to say about O’Grady’s performance. Thomas Patrick ‘Tom’ O’Grady ‘carried off the honours’ covering the 5 miles in a time of 9 minutes 10 seconds ‘at times he travelled at the rate of 39 miles an hour’. Some of the laps of 612 yards were covered in 33.25 seconds with one mile timed at 1min 33 seconds. It was the first occasion on which the machine had been tested, it was not completed until the Saturday morning, the average of 1min 50 seconds per mile ‘must be considered gratifying, particularly as a strong wind had to be contended with’. There were six starters in the second heat which was run at a lower pace with interest being lost when R Davis’ belt broke with 3 laps to go when he was overhauling the leaders. J Bullock won from FH Burden, RW Lewis, EF Wilksch and Davis. ‘The final between the first three in each heat will be run next Saturday’. In a full program of bicycle racing many of the motorised racers jumped onto their normal racing cycles. The Chronicle concluded its report by commenting favourably on the performance of ‘The Locomotive Band’, which gave a fine rendition of the march ‘Colonels Parade’, that there were no accidents during the day which ‘was well managed in every respect’. In keeping with the mood of the week a novel race on the road was also advised, this comprised, ‘…a contest between B Thompson’s 4.5 hp car and the Broken Hill Express train ‘in a scamper to the Burra, the chauffeur and the engine driver to shake hands at the Adelaide Railway Station before starting’! Logistically this would have been easy as Adelaide Station is only several hundred metres from Adelaide Oval. 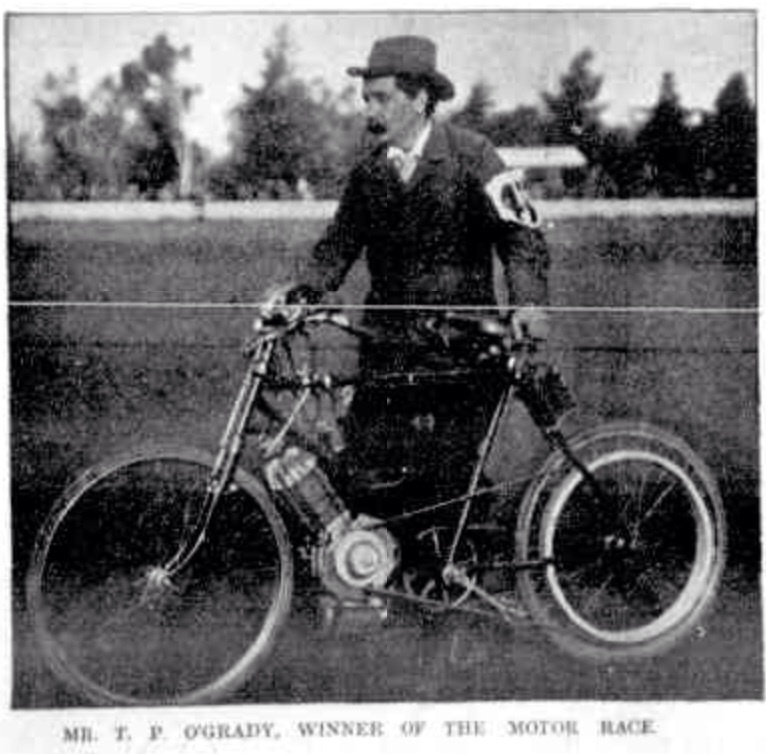 Firstly, the claim that the first motor-cycle race in the Southern Hemisphere was run at Adelaide Oval on 11 October 1902 and won by TP O’Grady on a local Lewis machine. It seems clear the first motor-cycle racers were graduates of bicycle racing.It makes sense doesn’t it in terms of the balance, competitiveness and the need for more speed required! 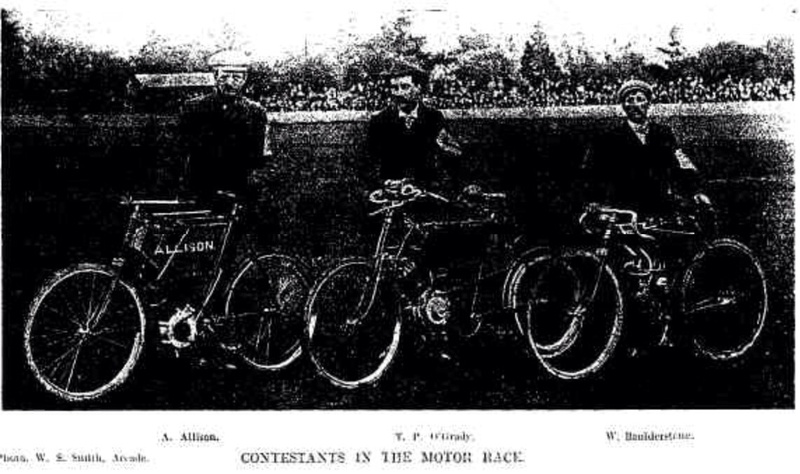 It also seems the case that the ‘League of Wheelmen’ saw motor cycle racing- and especially car competition which appears from the report to be the most popular event or motorised display on that October day, keys to future commercial success. To turn around their flagging gates. Of course the bike and car racers would soon go their own separate ways probably when a greater number of venues became available to them both on public roads and specialist, speedway, closed circuits. But for the moment the would be motorised racers needed venues and the cyclists had them, and ‘in good nick’ too. The organisers changed the spectator amenities during the week by allowing better viewing of the cars, perhaps by allowing the punters to get closer to the action. His Excellency the Lieutenant-Governor conferred his patronage to the carnival. ‘Visiting officers of the Australian Squadron have accepted the Leagues invitation to be present’ the Evening Journal notes in an article published on the day of the race. Its interesting in these modern times to see what was regarded as relevant then but now is very much ‘who gives a rats’ stuff. Similarly the language of the day is wonderful in its eloquence, the prose of times gone by I enjoy I must admit. Long-winded sometimes but enjoyable nonetheless! O’Grady’s ‘brilliant run’ of the week before stamped him as a certainty for the final, with many returning spectators expecting him to lap the field twice aboard his Lewis over the five mile duration of the final. The contemporary newspapers reported upon the riders but not the machines, sadly. So, in the main, we don’t have details of the bikes ridden on that important occasion. The final was a race between five competitors with TP O’Grady off scratch, A Allison 50 seconds, VR Burden and W Baulderstone off 1 minute 5 seconds and the limit-man J Bullock on 1 minute 20 seconds. A warm up for the bikes was provided during the cycle and motor parade which was also a feature of that days events. The competitors for the race had a trouble free run during this morning event. 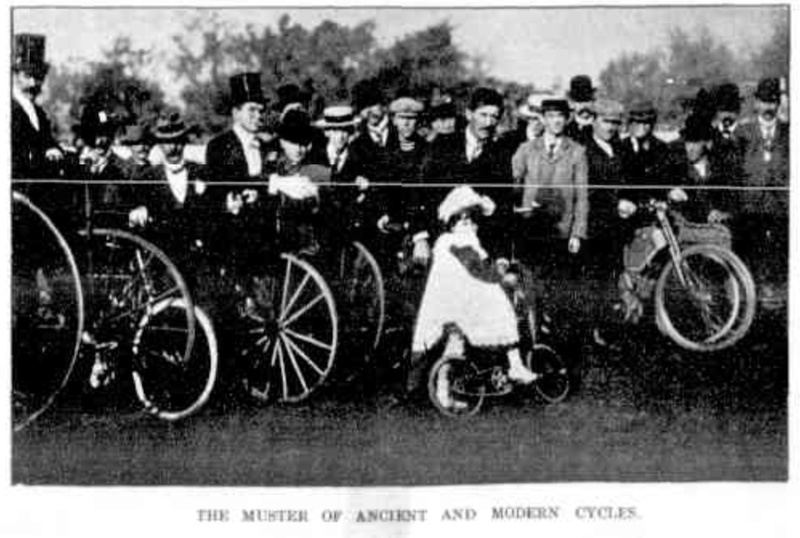 During the later stages of the afternoon, just before the feature cycling event ‘The Australasian Ten Miles’, won by Victorian DJ ‘Don’ Walker, the ‘Motor Race’ commenced. Bullock, Baulderstone, Burden and Allison completed a lap before O’Grady was pushed off from the start. There was general disappointment as the locally built Lewis bike was pulled onto the grass by its driver, the engine not firing properly. With 7 laps to go Burden passed the stationary O’ Grady, his ‘machine going splendidly’. 2 laps later Burden lapped Allison and with 4 to go caught Baulderstone again, with whom he had started. With 2 laps to run Burden passed Allison and finished an easy winner in 9 minutes 15 seconds. His time was 5 seconds slower than O’Grady’s over the same distance the week before. Bullock was 2nd in 9 mins 34 seconds and Baulderstone 3rd in 10 min 23 secs. Prize money for the race was ten, three and two pounds from first to third places. The distance between Adelaide Oval and the fringe of Victoria Park, site of the first Formula One Australian Grand Prix in 1985 is small, 1.5 Km, but the performance difference between the cars displayed and Keke Rosberg’s victorious 900bhp Williams FW10 Honda is immense. In their wildest dreams, a spectator present on that glorious October 1902 day who also attended the AGP on a similarly wonderful, hot day in November 1985 could not have conceived of cars of such vastly different performance and sophistication within their own lifetime?